Everyone forgets about Venus because it’s not Mars. Or Saturn. Or Jupiter, for that matter. Or, maybe it’s because Venus is a toxic wasteland. Still, the second planet from the Sun deserves a little more credit than it currently gets. Recently, a team of researchers NASA’s Jet Propulsion Laboratory dropped their latest design for a “clockwork” rover they hope will explore Venus—and the concept art is delightfully twisted. The Automaton Rover for Extreme Environments (AREE) project was first proposed back in 2015. 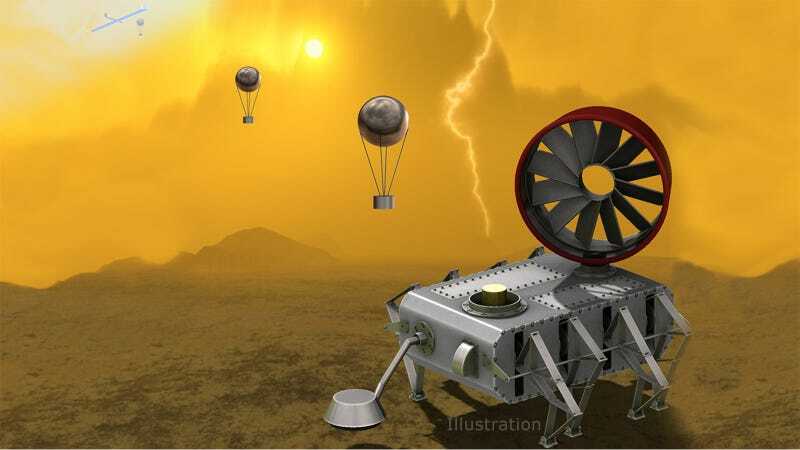 AREE is a rover that uses Venus’ harsh conditions conditions to its advantage, relying on wind to power its mechanical computer. Since Venus’ atmosphere is about 90 times denser than Earth’s and heats up to about 864 degrees Fahrenheit (462 degrees Celsius), designers have to make something hearty enough to sustain seriously hellish conditions. It’s also admittedly cool that the design for AREE looks like Wall-E’s evil twin. While Venus has been explored a handful of times in the past, no spacecraft has survived the surface for long. Though the planet has had a few visitors orbit it in recent years—including a probe from the ESA that launched in 2005—the last time a probe explored Venus’ surface was roughly 30 years ago, when the Soviet Vega mission sent a pair of balloons and landers to scope it out. Sadly, the landers only lasted a few hours in Venus’ hellish landscape. Ironically, the AREE team thinks it can utilize old technology—like Morse code and mechanical computers—to create the perfect new probe for Venus. Yes, you read that right: AREE would send Morse Code messages to balloons in Venus’ atmosphere, and then beam those messages back to Earth. The team thinks that in such a hostile region, “steampunk” computing might be better than relying on anything electronic. Building a Venus-hardy probe poses unique challenges, and a lot of folks are working on it. Another team at NASA, unrelated to AREE, is currently building computer chips out of silicon carbide that will hopefully withstand the atmosphere on a Venus trip someday. Right now, the AREE team is in the second phase of NASA’s Innovative Advanced Concepts program, working out the kinks in their design to create something better. The design is still in its very early stages and there’s no guarantee it’ll ever actually take off. But hopefully, AREE will get to Venus, eventually—there’s something heartwarming about a steampunk machine frolicking around the smog of an alien atmosphere.